Medal of Honor recipient Dakota Meyer has had a busy year since receiving the nation’s highest valor award in a ceremony at the White House in September. Mostly, his work has focused on public speaking appearances and raising money for the Marine Corps Scholarship Foundation. However, he’s also become perhaps the first Medal of Honor recipient to actively engage the public on social networking sites, including Facebook and Twitter. On top of that, he’s now added a blog outlining some of his work. “Actions Not Words” was launched March 16, and has been used since to highlight tornado relief work in which he and others have participated in West Liberty, Ky. 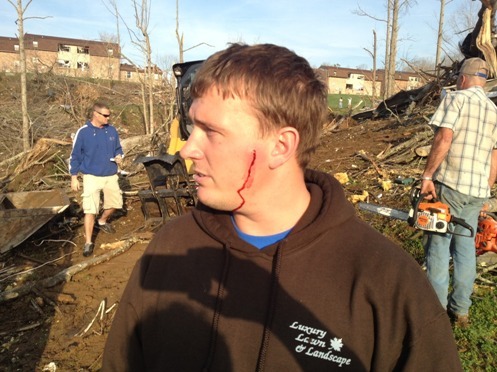 The photograph above shows Meyer after he “almost lost my head to a tree limb” that crashed into the cab of his Bobcat earthmover during relief work, he wrote this week. The sight is about 180 miles from his hometown of Greensburg. Meyer, now a sergeant in the Individual Ready Reserve, is credited with charging into an open kill zone multiple times on Sept. 8, 2009, in Ganjgal, Afghanistan, in an attempt to save four missing members of his embedded training team. I’ve reached out to Meyer to get his thoughts on launching the blog and the sights in West Liberty. I’ll add more here soon if I hear from him. He did both, Frank. There were several trips in vehicles and then he charged into the village of Ganjgal on foot.